Theo Ellsworth is a self-taught artist and storyteller living in the mountains of Montana with a witch doctor, their son and a slightly evil cat. He developed his art while wandering the United States in a motor powered vehicle. He is uncommonly fond of clouds, monsters, trees, and impossible objects. He is prone to fits of whimsy, and his mind is filled with preposterous notions, yet he still manages to come across as semi-normal. He spends as much time as possible making comics, art zines, and imaginary phenomenon. Theo’s comics can be found in the Secret Acres Emporium here. A combination of Where the Wild Things Are, a fever dream, a pagan woodland ceremony, and a notebook doodle. If you missed Book One, it might not be a problem, because despite the artist’s excessively explanatory dialogue, I’m baffled by the narrative and subtext of this eerie fairy tale (mostly taking place in the mind of an immobilized mummy and involving ghosts, a laughing demon and a three-eyed house gnome). But despite my confusion, I unequivocally enjoyed the bewildering experience of navigating this visual feast, due out in early November. It brought to mind another comparable cartoonist, Chicagoan Edie Fake. I could never follow his Gaylord Phoenix but I still consider it one of the greatest pieces of contemporary cartooning. Ellsworth, likewise, has cohesively combined the confounding and convincing. Ellsworth’s weird little tales sometimes read like acid trips of the future, complete with lonely robots and unknown creatures. But there’s also a nice personal story threading through this. I have no idea why this guy isn’t considered a comics God yet. Maybe someday he rightfully will be. In Understanding Monster Ellsworth delves into the minutia of the minutia of his brain’s inner realms, worlds that often function in opposition: colliding, refracting, and splintering. The story depicts the struggle to link these prismatic worlds, to get them working in harmony. He casts the classic quest to Find Oneself in a mythic, phantasmagorical light. Oh, there is a plot here: right at the outset our protagonist, Izadore, finds his spirit trapped inside a mouse’s body, while his “Phantom skeleton” calamitously roams free. He needs to escape from “negative time” and find his way back to his corporeal form to reintegrate his mind/body/spirit with the help of a fly, itself inhabited by another spirit, a spaceman called This Way That Way. In his quest, he’s aided by a host of benevolent creatures including one Inspector Gimble, who is his major guide and protector, a group of sentient toys and a green girl named Gill. Standing in his way, however, is a rogue’s gallery of antagonists ranging from the Devil to a pharaoh’s mummy to a group of terrible entities called the Mean Kids in the Walls. …Ellsworth conjures up a dizzying array of beautiful, intricately patterned, labyrinthine drawings, perfectly capturing the spiraling sprawl of the narrative within a narrative within a narrative. What keeps this soufflé from collapsing is this: no matter how bizarre the proceedings, Izadore’s odyssey always maintains its internal (il)logic. Somehow, Ellsworth manages to make a perfect sort of sense, and we root for Izadore to escape the forces aligned against him and complete his quest. Ellsworth’s deep imagination, as well as his idiosyncratic charm, humor, and sincerity are evident in every passage rendered, no matter how far out into the ether it may be. His trippy psychedelic home movies are projected directly from his head without ever forgetting the heart. In Ellsworth’s intricately crafted trilogy, a group of toys in a shapeshifting house save and revive Izadore, a being destined to transcend “Toy Mountain” and regain his corporeality. Along the way, a bevy of bizarre incidents and obstacles attempt to block Izadore. The story reflects Ellsworth’s own mentality and ideas on creativity and personality. While the bizarre plot can be impenetrably dense, most readers likely won’t care as they navigate through Ellsworth’s gorgeous hand-painted visuals. Virtually every page is overloaded with over-the-top illustrations that the average Joe would seemingly need to spend a year creating. Even though The Understanding Monster Book Two lasts just 72 pages, I couldn’t help but spend extra minutes gazing at all the lush details found in every page. So despite the plot regularly amping up the weirdness, I never found myself bored or demanding an explanation. I just sat back and enjoyed the utterly strange yet captivating ride. Ellsworth’s work reaches out and touches people of all ages through engaging illustrations and surreal storytelling. The intensity of his illustrations and storytelling is marked by a sensitive layering of color, finished with a graphic line. His approach relates to the language of the comic book. The stories are upbeat and touching, reflecting a tale of ultimate safety in the face of what some might interpret as dangerous situations, as in his The Understanding Monster. You could read The Understanding Monster in random order for its art alone. Despite all of its eddies and whorls and tangents, however, it’s genuinely propulsive right from the “reverse countdown” of its opening chapter. It’s a race against time to put together Izadore’s spiritual components. The inertia of doubt and fear wants to keep everything standing still, but motion, any motion, is the only way out. “I know the urge to stop is overwhelming, Izadore,” says the robot, “but you’re not going to stop. Go. Go. Go. Go. Go.” It’s vital that you keep your limbs in motion. The last few months killed whatever lingering ideas I had about critical objectivity. I probably experienced some great art that left me stone cold. And maybe this book wouldn’t have hit me so hard if I didn’t need to be reminded to keep turning the pages. Ignore the ghosts. Accept outside help. Put yourself together again. Theo Ellsworth‘s Euro album-format The Understanding Monster Book One, a Secret Acres release and unquestionably the most relentlessly psychedelic comic I’ve encountered in 2012, pitched somewhere in between the handmade decoration of Lynda Barry and the textured sci-fi chaos of Brendan McCarthy circa Freakwave, with lunges into post-underground Psychedoolia merriment and… I dunno, Joseph Cornell’s boxes. And Toy Story. I’m kind of at a loss for words, or even a plot summary – please allow the above image to make do while I try to figure something out. Mean kids are hiding inside your walls. Oh, it’s so clever and so resoundingly lush. There are textures and patterns everywhere: wool, woven linen, ornamental wallpaper, feathered scales and whorled wood. Within the ultra-inventive panel and page configurations the colours are dark and opaque and speak of ancient homes: greens and blues and rich, ruddy-brown wood and fur. Fur? Izadore first manifests itself as a mouse. Very timid and susceptible to distractions. It all begins when the clock strikes Negative Nine. Theo Ellsworth draws obsessively detailed drawings and self-publishes comics, mini comics, and zines about imaginary people and places. The cosmic imagery, subtle geometry, and implied animism in his works recall the epic, heroic, and odd imagery of Jean “Moebius” Girard, Mayan ruins, and the Nazca lines, filtered through the jam-packed and often psychedelic lens of underground comix from the ’70s. (Ellsworth’s first “real” book, Capacity, was weird, wordy, and wonderful, and published by Secret Acres in 2008.) Taking part in art shows affords the Portland, OR-based artist opportunities to experiment with color, explore larger frames, and let his imagination fly–or spelunk or dive, depending on his mood. There’s been a recent trend where artwork has become secondary to storytelling in comics; a mere glance at a book’s hazy imagery is all that is necessary to keep the story moving along. When Bryan Lee O’Malley’s critically acclaimed 2004 indie gem Scott Pilgrim first appeared, readers overlooked the book’s crude cartoony look because of the strength of the storytelling and the premise. In contrast to that trend, Ellsworth’s dense, mesmerizing compositions aren’t easy to ignore. In The Understanding Monster he weaves a story that can be difficult to wrap your head around—in a good way—but the real challenge is not getting lost in the hyper-detail of every page, each one deserving of being blown up into large college dorm posters. 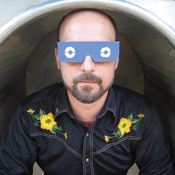 Ellsworth’s previous releases through publisher Secret Acres include both an autobiographical odyssey, Capacity, and a series of oddball vignettes in his 2009 entry, Sleeper Car. Ellsworth turned a few heads in the indie comic realm in 2010, when one of the short stories from Sleeper Car was featured in that year’s edition of The Best American Comics. By the time “Book One” of The Understanding Monster concludes, Izadore finds the nature of his/her/its reality completely transformed. But, as the book’s teaser-filled denouement proclaims, this story is just the beginning. In other words, we can look forward to a story that extends beyond Izadore’s expanding psyche—and even time itself. Rather than outward experience, Ellsworth’s subject is his innermost imagination. “Since I was very young, I have known that I was meant to tell the stories of the characters that I see inside my head,” he writes. “Climbing back there and visually recording my findings has always been a weirdly natural process.” Indeed the striking accompanying illustration, typical of the book, shows a roller coasterlike road system traversing living forests, creature-rich rivers, wise-eyed mountains and on into space, from which waves a friendly paw. Yet, as Ellsworth describes it, investigating this world is almost impossible without losing a coherent sense of self and story. If waking existence unspools far faster than our ability to gather it, after all, imagine the even-more-difficult task of fully possessing everything we dream. By analogy, Capacity offers the tale of a young puppeteer putting on a play for himself. “He did so simply for the novelty of getting to be both…the actors and the audience simultaneously,” Ellsworth writes: but his puppets built their own puppets, and those puppets, in turn, built their own. And all of the puppets put on their own plays for the puppets that came before them. The plays were filled with strange ideas that the boy had never thought of before. He suddenly realized that he should be writing these ideas down, but his hands were already full. To make matters worse, the theatre was on a wagon that had begun to roll steadily down hill. By the time he had safely stopped the wagon, he couldn’t remember any of the ideas, and the puppets refused to repeat a single word. Such conundrums are as old as literature, present in Don Quixote and Tristram Shandy, the poetry of Coleridge and Keats, and even the movies “The Terminator” and “The Matrix.” Like life itself, they have no solution because, save death, they accept no boundaries. Theo Ellsworth’s imaginary cities are densely populated with funny monsters, hybrid animals, Mazatec gods, visiting aliens, and other members of his seemingly infinite bestiary. And yet they’re a little lonely, too, and their creator seems to want company. Perhaps that’s why, over the course of Capacity– which sandwiches all seven issues of the Portland, Oregon, artist’s eponymous self-published comic between a hundred pages of semiautobiographical hide-and-seek–Ellsworth seeks, again and again, to transform the reader into his silent witness and co-conspirator. Upon being inserted (gently) into Ellsworth’s intricately rendered imaginary world, a place in which Maurice Sendak or Dr. Seuss would feel right at home, the reader is gradually initiated into the artist’s hermetic headspace. We learn about his creative process (long walks spark countless interior “skits” he subsequently draws into existence) and about his personal life (living in his car and house sitting gradually gave way to his current domestic tranquility). After initially fearing that his demons would catch him, Ellsworth now relies on his own, self-created monsters to catch him when he falls. Ellsworth matures impressively as an artist over the course of Capacity’s seven issues. The withdrawn cartoonist in issue one assumes an almost shamanic identity by the end of its run. The narrative, such as it is, remains secondary to the many elaborate full-page illustrations that pepper the book. Entire worlds condense into symbolic headgear in some of drawings; bodies, cities, and amusement parks metastasize into something considerably trippier than the sum of their parts in others. Theo Ellsworth’s Capacity is an idiosyncratic masterpiece. Beneath its surface level of animistic surrealism it is essentially a creative coming-of-age story which narrates the story of its own creation along with its creator’s struggles to learn how to channel his unusually direct connection to his dreamworld and fantasy life onto the page. It’s constantly surprising and full of charm. It’s not an easy or straightforward read, so be prepared to spend some time with this one, it’s worth your time. Remember, too, that Theo’s hilarious, absurdist short story, “Norman Eight’s Left Arm,” appears in the current Best American Comics volume. Theo’s greatest strengths lays in his cartooning, and when the guy starts drawing these gigantic fantasy structures, these gargantuan Aztec-looking statues covered in slides and highways, it makes for a brilliant experience. It helps that Theo embraces one solid fact throughout, a simple one that would benefit anyone who tries to spend their time creating fantasy architecture: make sure that the fantastic has logic. No matter how easy it would be for Ellsworth to just draw his intricate structures with no rhyme or reason, he takes the time to construct some kind of convoluted—yet wholly accurate—Rube Goldberg structure, often by way of the smooth plastic of the old Mousetrap board game. Sure, these mazes, these slides and pennywhistle compounds that end up looking like some kind of alien oil rig on Jack Kirby’s Apokolips–they couldn’t ever be “real.” But they’ve got weight to them, and the path the little substitute character takes is one that makes sense. You can trace it with your finger–and if the odd little pieces of text are to be believed, Ellsworth would probably like it much better if you did. By the end of the book, I was so engrossed by the uniqueness of Ellsworth’s project and the skill of its execution that I never even really thought about how potentially disjointed such a book could seem in less assured hands. But not only does it all flow rather seamlessly, there’s a final-pages reveal/twist that cleverly and delightfully links together long-abandoned story strands to uncover a throughline that was there all along. It’s a wildly successful little story-as-puzzle moment, like a great Grant Morrison comic or David Lynch film. It makes you want to go back and re-read the whole thing, not “to see what you missed” or anything but just because it would be fun and rewarding to do so. I have a feeling this will be a book I’m diving into every now and then for a long time to come. Just when I’ve cynically decided that the whole “graphic novels” bit has been hopelessly overrun by huge publishers looking to cash in on the next hip thing with the umpteen-millionth graphic novel memoir about disease/identity politics, etc., I find something like Theo Ellsworth’s Capacity to renew my faith in the art form. The book–a collection of Ellsworth’s mini-comics of the same name, with a ton of material added in, mostly as a framing story throughout–is part memoir, part dream journal, part exploration of the creative process. It’s beautifully drawn in a hyper-detailed, almost etching-like style that’s a bit reminiscent of Thai art in places. The author’s writing about his own creative pursuits is insightful and analytical without being stuffy or self-important; in fact, it’s often quite funny. While I suspect that the similarly-themed What It Is by Lynda Barry will garnish more of the limelight than Capacity will, this book seems somehow more intimate. Theo Ellsworth’s book Capacity defies easy description. I admire Secret Acres’ publishers, Leon Avelino and Barry Matthews, for taking on yet another highly unusual project of an artist whose work up to that point had only been in mini-comics form. Like with Sam Gaskin’s Fatal Faux-Pas and Eamon Espey’s Wormdye, Capacity isn’t simply a collection of minicomics, but a fully cohesive work with all sorts of unusual thematic connections. It’s part autobiography, part transcription of a series of waking dreams, part epic and part art exercise. It is, in a sense, a senior thesis for Ellsworth’s own personal art school. It’s filled with false starts, left turns, haunting images, abandoned ideas and a conclusion that stitches them all together. It is the artist’s way of tricking himself into getting at other stories. It is a form of ritual and sacrifice that is only concluded upon having been read. It is a nesting series of eggs that give birth to each other. If you were wondering if art could be made that is both self-aware and sincere, experimental but not at the cost of being humanistic, here is your answer. This ability to make a self-reflexive piece of art that is neither ironic nor over-stylized is what is truly exciting and innovative about Theo Ellsworth’s first full-length graphic novel. Capacity does not just show you magic, but embodies magic itself. In a year where self-reflexivity seemed either overshadowed by the drum machine or hampered by the wry, snarky smile of the silver screen, Capacity manages to avoid being gimmicky in its look inward and instead enchant and endear. I love Theo Ellsworth’s Capacity graphic novel. The art is often intricate and ornate and its one of the most imaginative, magical books I’ve ever experienced. It’s full of strange creatures, bizarre happenings and complex contraptions for a beautiful final product. I really like how Capacity is a lot about the creative process, how it works, where it comes from, and the author’s personal experiences with the demons associated with creating. It was very encouraging and thoughtful and left me feeling quite inspired. Whether trudging through an underwater town or skulking along dangerous meandering streets, readers get to follow the author on a quest for understanding himself, a place to feel inspired, and a way to put aside distractions long enough to put one idea to paper. I’ll admit that once the actual “Capacity” comics began, I was a little fidgety, hoping to get back to the interesting happenings at the opening of this graphic novel and how the author came to create his “Capacity” comics, but the actual comics soon warmed up to me and kind of took on the tone of the overall book, so I enjoyed the hell out of them as well. This is one of those books where you really don’t want to rush through it, but stop to stare at the crazy beautiful art on the pages, kind of savor it before moving on. I really can’t recommend this whimsical journey through one man’s mind enough. A true treasure. Theo lives in another world. Most of the work in Capacity looks like he does it on the fly, just letting his mind wander and go wild. It’s really an adventure to read his mini-comics. The latest issue, #6, is by far his best, as he has perfected his craft. Don’t overlook this gem when you’re searching for something original. Ellsworth is such an incredible draftsman, he’s bound to be discovered by the crew at Fantagraphics or D&Q sooner or later. His artwork is reminiscent in some senses of David B’s Epileptic, though it’s more free-spirited, and certainly more richly textured. There’s also a healthy dose of Jim Woodring mixed in there, though more in the bizarre concepts and characters than in the actual drawing style. Rather than straightforward storytelling, Ellsworth experiments with visual poems and short strips, including several pages of single panel gags, entitled “Shorts (as Opposed to Pants).” But the real highlight of the sixth issue is the opening poem, “Thoughts” in which the artist strips away all barriers of storytelling and character and simply lets his imagination run wild on the page, accompanied only by the sparse lyrics of his simple rhyme. What Ellsworth is really doing here is exploring the origins and nature of his own thoughts, and the whole thing is filled with fascinating creatures, machines and landscapes so compelling, you literally feel like an explorer visiting some distant planet. Ellsworth’s line control is amazingly precise and his panels are dense with his singular visions, yet despite the meticulous detail, everything is clearly defined. The story also makes clever use of the thought balloon, that ubiquitous storytelling device that is often taken for granted, as he literally surrounds his panels with thought clouds. Ellsworth also hand letters everything in the book, assimilating the text into the art, adding to the overall effect. With scaled and feathered monsters and boundary-blurring odysseys, Theo Ellsworth’s dense black-and-white work evokes Sendak’s Where The Wild Things Are. It might take some time to interpret some of the bizarre images in this hefty hardbound tome.